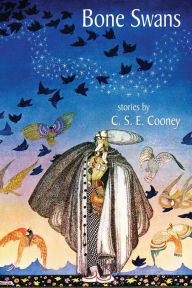 In this anthology, Cooney offers five extraordinary tales which mix myth, fairy tale, fantasy, science fiction, and horror. In “Life on the Sun,” a runaway princess must choose between her life and love, and a sacrifice necessary to save her people. In the title story, a mash-up of The Swan Princess, The Pied Piper of Hamlin, and The Singing Bones, an irrepressible rat teams up with a swan princess and a fae-gifted bard to bring down a monster preying on swans and children alike. In “Martyr’s Gem,” the last island in the world is home to a matriarchal civilization — and when the daughter of one of the great families summons a poor fisherman to marry her, neither is prepared for what they discover. In “How the Milkmaid Struck a Bargain With the Crooked One,” a poor but clever girl finds herself caught in a war between church and state and fae. Finally, “The Big Bah-Ha” is a dark, disturbing science fiction tale of children and monstrous clowns. I can now add CSE Cooney to that list. I devoured this collection. I looked forward to every break at work because I knew that I had Bone Swans waiting for me. Then I realized that I was reading too fast, that I would be out of book soon, so I forced myself to slow down. The language is so dense, the world-building so rich, the characters so compelling, that I will happily return to Bone Swans again and again. Highly recommended to fans of CS MacCath, Catherynne M Valente, and Annie Bellet.